I’m happy to have developed today’s recipe for Classic Sausage Gravy as part of my partnership with Horizon Organic. I love cooking with their naturally good products and I feel great about feeding them to my active kids. And my whole family loves Classic Sausage Gravy made with wonderful Horizon Organic Whole Milk. 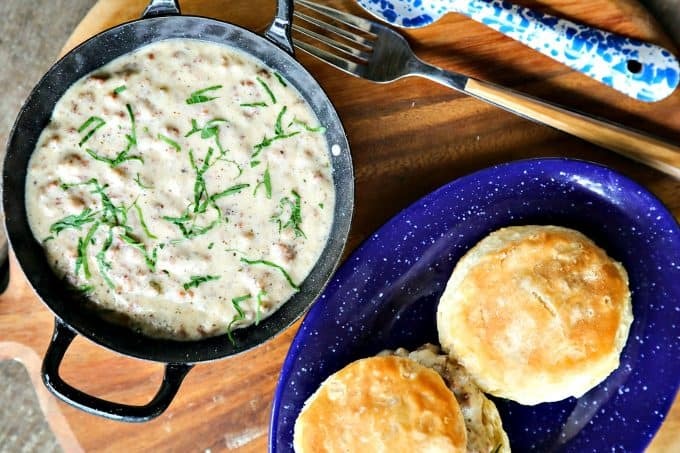 Savoury, creamy, peppery, and tremendously simple to make, Classic Sausage Gravy is soul-warming whether served over flaky, buttermilk biscuits or humble toast. There are many advantages to having grown up with a Southern grandma, but one of the most outstanding was the food. Oh, my grandma’s food. I still don’t know how she turned out such massive quantities of such wonderful food seemingly effortlessly. It was all cooked with love and it all tasted the better for it. 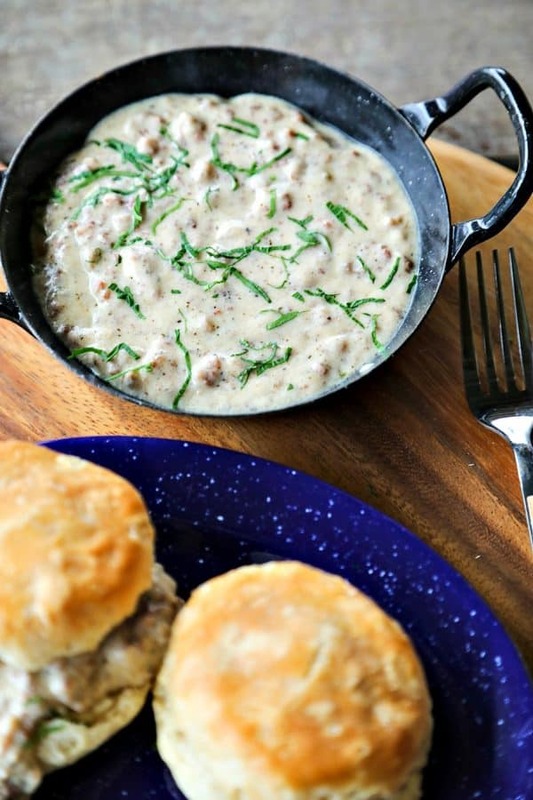 My grandma’s biscuits were the stuff of legend, and the most natural pairing for biscuits is always going to be Classic Sausage Gravy, in my mind. Grandma’s gravy will always remain my benchmark by which I judge all other sausage gravies. I remember hers being made in a cast-iron skillet which allowed her to render all the fat from the sausage and get the lovely toasty brown bits that I covet so much in a gravy. She also added a little dried sage or poultry seasoning (whichever she had on hand). To me, classic sausage gravy is irrevocably linked to cold weather, and most often the holiday season. That little bit of sage that Grandma added made a dish that exuded comfort seem like a festive one, too. Do you have any dishes from your childhood that make you think of warm family memories? Let’s talk sausage selection. A bulk pork breakfast style sausage is the ultimate choice for Classic Sausage Gravy. If you can’t find it, you can substitute link style, but remove the sausage from the casings and break it up in the pan. I don’t do a maple flavoured breakfast sausage, but that’s just personal preference. Could you use a turkey sausage? Yes… with one important caveat. You’ll need to add fat because the rendered fat from the sausage is what helps form the base of the roux for the gravy. Don’t use a non-stick skillet for two important reasons: 1) You’ll be scraping and whisking and you don’t want to risk flaking the non-stick coating into your gravy. That would be most unpleasant. And 2) non-stick pans are not ideal for browning sausage. To get the fat hot enough to get those delicious mahogany brown bits, you have to raise the heat to a temperature that is not recommended for non-stick pans. 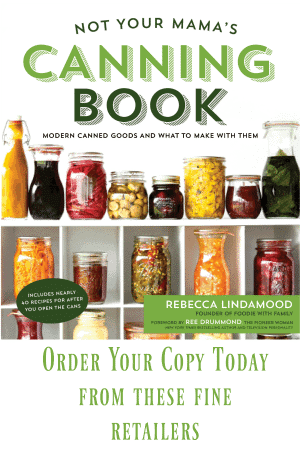 I’d stick with cast-iron or heavy stainless steel. Thankfully, those are both pretty inexpensive kitchen staples to have around. How much you break up the sausage while cooking is up to your own personal preference, but I prefer to make mine very fine. This increases the surface area for the toasty brown bits which directly increases my happiness. Scientific fact, y’all. Don’t be tempted to skimp on the black pepper. Black pepper is absolutely crucial to good Classic Sausage Gravy. Ditto the nutmeg! And if you have fresh nutmegs that you can grate for your nutmeg, so much the better! 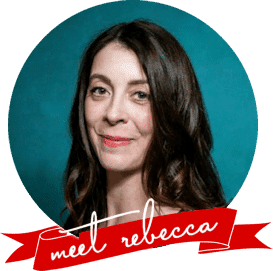 Bonus: don’t worry about those whole nutmegs rattling around your spice drawer. They stay good practically forever and taste so much better than the pre-ground stuff. 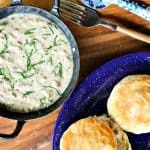 Ohmygoodness, please do not be tempted to make this Classic Sausage Gravy with low fat or reduced fat milk. Please go for the gusto and use whole milk. 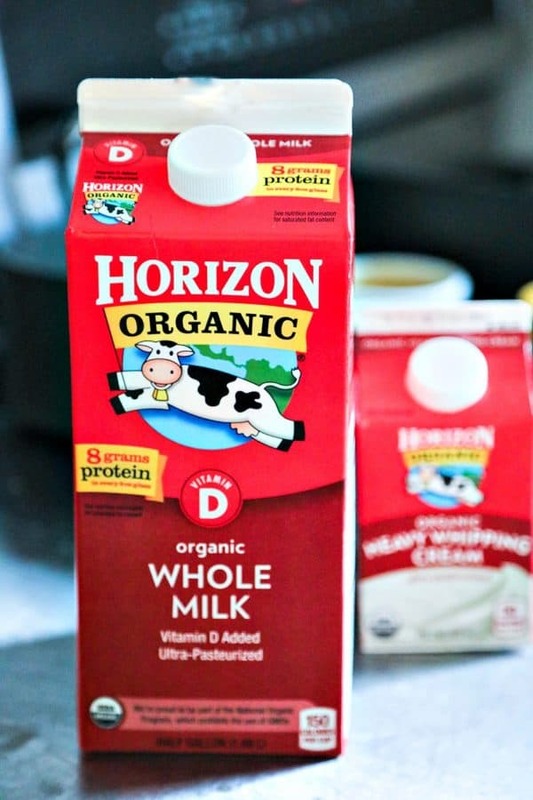 And while you’re at it, choose an excellent whole milk like Horizon Organic’s Whole Milk. When you have so few ingredients in a dish, it’s best to choose wisely! You’re definitely going to want to serve this with homemade flaky buttermilk biscuits! Savoury, creamy, peppery, and tremendously simple to make, Classic Sausage Gravy is soul-warming whether served over flaky, buttermilk biscuits or humble toast. Place a cast-iron or heavy-bottomed stainless steel skillet over medium high heat. Add the pork sausage and break up with a chop-and-stir or wooden spoon. Continue breaking up the sausage, cooking until the fat has rendered and the sausage has toasty brown bits interspersed through it. Lower the heat to medium low and sprinkle the flour evenly over it. Use a whisk or the spatula to stir it in to distribute evenly. Continue cooking and stirring for another 2 minutes. Pour in half of the milk and whisk, scraping the bottom of the pan repeatedly, until smooth. Pour in the second half of the milk and whisk, still scraping the pan until you feel all the toasted bits stuck to the bottom have been released into the gravy. Whisk in the black pepper and dried sage or poultry seasoning. Raise the heat to medium and bring to a boil, whisking constantly. Drop the heat once again to low and simmer until thickened, about 2-3 minutes. Remove from the heat and garnish, if desired, with fresh parsley. Perfect for the upcoming cold weather…such a classic comfort food! I’m so excited for you to try the recipe, too! Please check back in and let me know if you liked it. And a pheasant hunting lodge sounds like an amazing get away! Wow I never thought to put sage or nutmeg in but now I MUST try it! My wife is from the South and so, of course, we make gravy (and homemade biscuits) but I don’t think we have tried it this way. Lately we have been on a Dutch Baby kick but it’s time for something different for our usual Sunday morning lazy day breakfast! Thanks, Jim! I hope you like it this way!